There were several reasons for farming animals in this period. One of the chief reasons for keeping animals was the provision of food, such as meat, milk products, eggs, etc. Wool and leather were also imporant products, and some animals were kept to work the land, such as oxen to pull the plough, or horses to be ridden (see farming equipment). 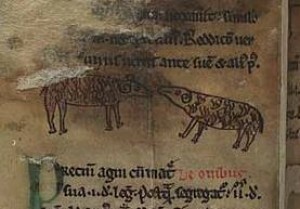 Animals were sold in markets and it was necessary to drive (see Droving) the animals to reach those markets, whether near or far, as did Guto'r Glyn according to poem 44.